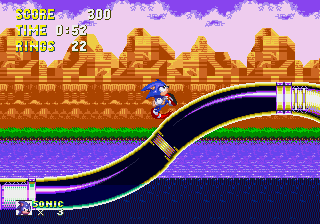 Launch Base Zone is the sixth zone in Sonic 3. All characters would enter by popping out of a patch of snow at the beginning. Unlike most of Robotnik's bases, this one isn't a completely robotic fortress of machines; instead, it is basically a very large construction site where he is repairing the Death Egg. In S3&K, the part of the level where Knuckles had faced his bosses would blow up and send him falling to Mushroom Hill Zone. With Sonic, Tails would fly him into the next zone after the bosses. The zone uses a technique for showing/hiding tiles indoors and outdoors. This effect was originally used in Sonic 2's Wing Fortress Zone as a one-off, but like many of Sonic 2s' one-off features, it appears several times in S3&K, being used in Angel Island Zone (Act 1), this zone and Flying Battery Zone. The Zone is rendered slightly less dangerous when played as part of Sonic 3 & Knuckles as opposed to just Sonic 3, with several enemies and several sets of spikes above doorways removed from Act 1, and Robotnik monitors and some of the boss fights dropped from Act 2. Orbinaut — A silver orb surrounded by four spiked orbs. Corkey — A gray energy cannon. Snail Blaster — A snail with protective sheath that covers blaster cannons. When using debug mode to go above the Act 2 boss arena, Death Egg art is present. This art isn't actually used anywhere in normal play, and its presence shows that the art was completed by this time in development. 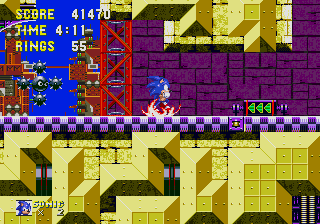 When playing as Super Sonic in Act 1, if the player holds left whilst Super Sonic is inside a "spinning elevator," he will glitch outside the elevator in the "push" pose before the doors of the elevator open. There is a point where Robotnik appears early and attempts to take a block. He will flee when Sonic reaches a certain height on the screen. However, if Sonic never reaches that height, Tails can still attack Robotnik. After 256 hits, Robotnik "pops" like any other enemy and a flicky escapes. See this video. Super Tails can actually get into part of Knuckles' area by getting close and having a Super Flicky hit a switch. This will open up a Knuckles only area below allowing Tails to access it. This can also be accomplished with Hyper Sonic, by jump dashing close to the ground. Make sure the switch object is on screen as you dash. You must avoid Eggman's black balls, shot out from under or over a disappearing ledge on the right-hand side of the screen, while jumping on the ledge to hit him. This boss is comprised of three sections in addition to the Eggmobile: two lasers and a rocket. After four hits one laser breaks off, after another four hits the other breaks off and after the last hit, the rocket breaks off. It's not that easy, though: circling the column is a small orb that when hit will hurt you, so be careful. Eggman will swoop across the screen and you must jump between the spiky top and the claw to hit him. After two swoops with Sonic or Tails, or four swoops with Knuckles, he will start floating across the top of the screen, drop down, and move across the platform a few times, his spikes protruding from the platform, before starting the cycle anew. Eggman can't be hit during the phase where he is floating across the top and bottom of the screen. If playing Sonic 3, when you are fighting this boss as Super Sonic, this boss has the ability to squeeze Sonic and drop his rings, losing his Super ability in the process. This issue is not present if that game is locked on to Sonic & Knuckles: in the combined game, Sonic does not fight this boss; Knuckles does, but this behaviour has been removed if the player uses Super or Hyper Knuckles.